Part time US President George W. Bush has announced that he will not attend his Republican Party’s National Convention in Minnesota due to the evacuation and impending crisis in New Orleans. "My soothsayers told me that the wrath of God Almighty would be descending on New Orleans at about the same time that I was scheduled to make a speech in support of that nice old Mr McCain," explained President Bush. "At times of crisis I am bound by duty to help the people of Louisiana just as I have helped tens of thousands in Afghanistan and Iraq." White House aides say that President Bush was to take time out from his busy schedule of dancing with international dignitaries to be on the beach as Hurricane Gustav arrives so that he can hold it back to prevent more flooding of God’s Country. "I am the Commander-in-Chief and therefore I will be right there, in the surf, commanding this Gustav fellow to go back to Godless Cuba where it can only kill communists and not God fearing Christians," said the President as he was shown a map of the USA. "Hey we’re going near Georgia, we should say ‘Hey’ to that nice Mr Putin who has just put his army there." When asked if he felt there was any reason why the people of New Orleans should suffer losing their homes and livelihoods twice in three years, President Bush said that the solution lay at the State and not Federal level. "The place is full of French Catholics and Voodoo," he said. "Even the ones I save are probably going to hell." Mrs Bush said that it wasn’t just her husband’s duty as President to save American citizens but it was a historical role she felt he had to fulfil. 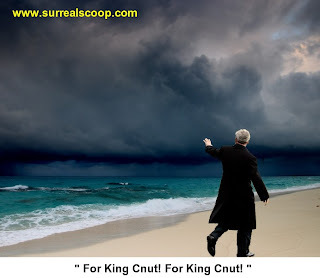 She said: "I now understand why all those people lining the streets in London where chanting ‘For King Cnut! For King Cnut!’ as we passed." Like it!!! made me chuckle..